Billed as “Understanding the Threat” and “A One-Of-A-Kind Training Event,” Guandolo plans to host the trainings at the Centennial Gun Club to be held Aug. 13-15. Its key component is a “Radicalization Map Locator,” listing the addresses of every Muslim Student Association (MSA) in the country as well as a number of mosques and Islamic institutions– all listed as suspected national security concerns. Just this year, Guandolo told a crowd in South Carolina that the sole purpose of MSA’s is to “recruit jihadis” – many in the anti-Muslim movement claim MSA’s are a front for the Muslim Brotherhood. In short, the “Thin Blue Line” project identifies targets for law enforcement and government agencies to monitor. Law enforcement agencies have gone too far in monitoring Muslims before. 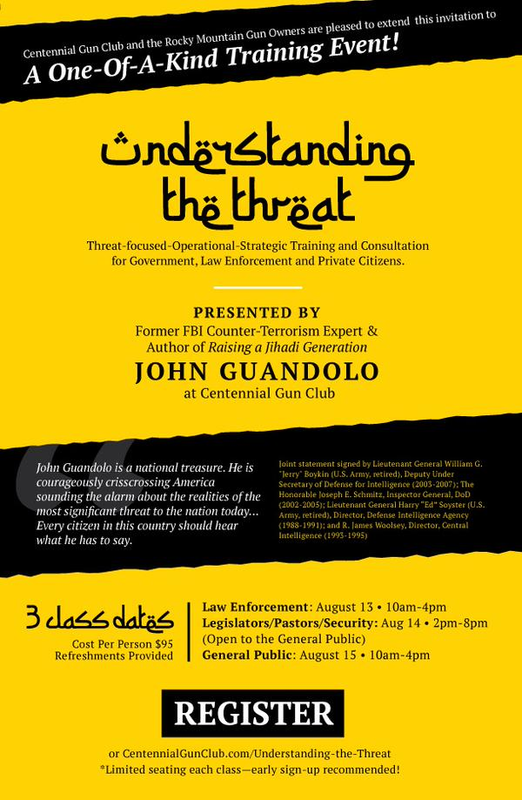 Guandolo’s history of anti-Muslim statements and associations with anti-Muslim groups clearly indicates that his trainings on the “threat” of radical Islam are biased. The fact that Guandolo is still able to train law enforcement following his disgraced exit from the FBI is also troubling. Law enforcement, elected officials and clergy in the Denver area would do well to avoid his course later this week.